ZAYED Port in Abu Dhabi, UAE, has welcomed the maiden call by boutique German cruise operator Phoenix Reisen and its flagship Artania. The arrival of the nine-decked, 45,000 tonne Artania – the largest ocean-going ship of the new-to-market operator’s portfolio – launched a dual-season two-ship presence by Phoenix Reisen in Abu Dhabi and will be followed by the arrival of Amadea in April, with the company’s Albatros joining the Amadea for the October-April 2014/2015 season. “The number of maiden calls in the current cruise season 2013/14 has doubled compared to last season, which is a clear indicator of the rapidly growing cruise business in Abu Dhabi. For this season we have further enhanced our facilities and services for the passengers and cruise liners. Over the next few years we will continue our efforts to develop Zayed Port and Abu Dhabi into a world-class cruise destination that offers exciting and unforgettable leisure experiences,” says Mohamed Juma Al Shamisi, CEO, Abu Dhabi Ports Company (ADPC). 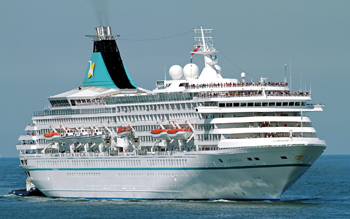 Artania’s 1,200 mostly German guests can choose from five full and half-day Abu Dhabi shore excursion opportunities, and will experience an all-inclusive classic cruise experience with modern facilities including internet cafés , two restaurants, an open-deck lido buffet dining option, theatre, gym and a spa and wellness centre featuring saunas, showers and massage cabins. Extensively renovated in 2012, Artania’s 620 exterior cabins all feature either panoramic windows or private balconies, and sails on to Oman, India, Sri Lanka, Indonesia, Thailand and Malaysia as part of a 17-day Arabian Gulf and Indian Ocean ‘Modern Metropolises and Asian Natural Paradises’ voyage to Singapore. Abu Dhabi’s inclusion on the Phoenix Reisen itineraries requires the destination to play to its cultural strengths for shore excursion options, which are increasing in demand, according to Agata Eibel, cruise manager for Artania’s shore-based tour operator Rida International Tours.